Here, I highlight a recent preprint describing an application of Artificial Intelligence/Machine Learning (AI/ML) methods to problems in computational chemistry and physics. The group previously published the intrinsic map dynamics (iMapD) method, which I also highlighted here on Computational Chemistry Highlights. The basic idea in the previous study was to use an automated trajectory-based approach (as opposed to a collective variable-based approach) to explore the free-energy surface a computationally expensive Hamiltonian that describes a complex biochemical system. Fig 1: Schematic flow chart of the AI-assisted MD simulation algorithm. The innovation in their current approach is the combination of the sampling scheme, statistical inference, and deep learning to construct a framework where sampling and mechanistic interpretation happens simultaneously – an important milestone towards completely “autonomous production and interpretation of MD simulations of rare events,” as the authors themselves remark. It is reassuring to see that the method correctly identifies known results for benchmark cases (the alanine dipeptide and LiCl dissociation) and out-competes traditional approaches such as transition path sampling in terms of efficiency. In these simple model cases, however, complexity is relatively low and sampling is cheap. I will be looking forward to seeing the method applied to a much more complex problem in the future; E.g. a problem where ergodicity is a major issue other challenges, such as hysteresis, plays a significant role. Another much appreciated aspect of general interest in this paper that I am emphasizing is the practical approach to interpretation of the constructed neural networks. 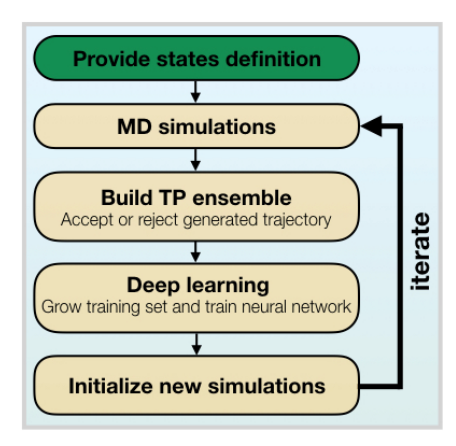 All in all, there are many useful comments and observations in this preprint and I would recommend reading it thoroughly for those who seek to use modern AI-based methods on molecular simulations.